Wesley Snipes A Flight Risk? MARCH 25--Arguing that convicted tax cheat Wesley Snipes recently violated terms of his bail by attending the lavish "party of the decade" in Dubai, federal prosecutors are opposing the actor's request to travel to Africa and Europe to film movies. In a March 24 U.S. District Court filing, government lawyers argue that Snipes, 46, made an "unauthorized" trip last November to the United Arab Emirates for the star-studded opening of the $1.5 billion Atlantis, The Palm Hotel. As a result of the Dubai trip, a federal judge in Florida ordered Snipes to surrender his passport. Prosecutors apparently only learned of Snipes's travel to Dubai when paparazzi photos from the hotel opening were published. One such image, seen at left, was included as an exhibit to yesterday's government filing, an excerpt of which you'll find here. Snipes was sentenced last year to three years in prison following his conviction on three misdemeanor tax charges. He is free on bail while appealing his conviction. 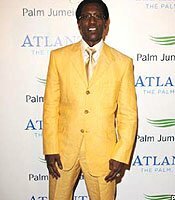 Last week, Snipes sought permission to travel to Italy for 14 weeks to film "Game of Death." He also wants to spend two weeks in Namibia for reshoots on "Gallowwalker."